The runner and jumper worked on his technique with Mustangs coach Eric Giorlando and hopes to be No. 1 in the state at the end of the season. Kenneth Wei was in mid-air when it hit him — he hadn’t hit the ground yet. 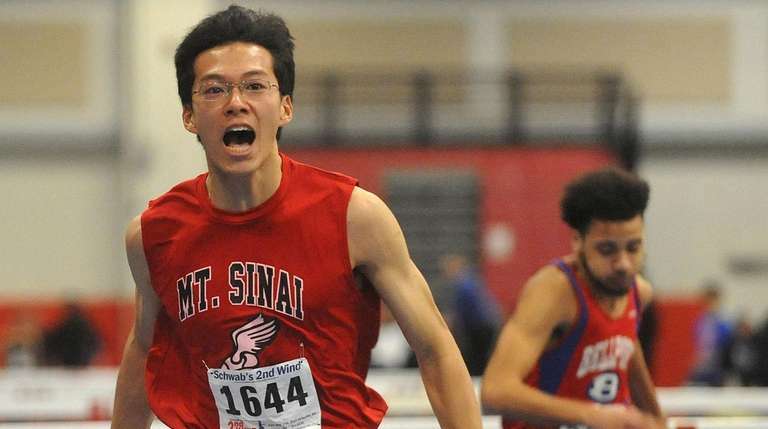 The Mount Sinai senior wasn’t impressed with his preliminary offerings in the long jump at last weekend’s Molloy Stanner Games at the Armory in Manhattan. But once Wei found himself in the finals, everything changed — including his hang time. Shortly before the finals began, Wei worked on his landing and takeoff with Mt. Sinai coach Eric Giorlando, hoping to capture a single moment of greatness that would carry him to victory. “He told me to pull my arms through when I’m completing my jump as my heals hit the sand,” said Wei, who intends to run and jump at MIT next year. “He showed me a few bounds to get my knees up in in the air. It engaged all the different muscles I had to use for the jump." What followed was the best long jump that Wei’s ever done — and the best in the country this season. Wei flew 24 feet to win, the top mark in the nation as of Friday, according to milesplit.com. It has Wei thinking about both a state and a national title in March. And on Saturday morning, Wei won the 55-meter hurdles (7.68), long jump (23-5) and triple jump (45-8.5) at the Suffolk V championships at Suffolk CCC-Brentwood. This is a culmination of a really long process for Wei. He said he really got serious about winning titles and hitting high marks last season, increasing his training and lifting weights. This season, the dividends are evident. Wei is, by no means, a brand new name on the Suffolk leaderboard — he’s the defending small school 55-meter hurdles county champion. But having this sort of national presence is something he’s never quite experienced before. It is, no doubt, the result of hard work. Wei said he spends a lot of time in the weight room, getting stronger with a healthy regimen of back squats, leg presses, calf raises, and box jumps. While he’s burst on the national scene as a long jumper, Wei is still a tremendously successful 55-meter hurdler. He won in 7.47 seconds at the Molloy Stanner Games, the best time on Long Island as of Friday. While Wei appreciates what it means to be the standard-bearer in that event, he is also very aware of how strong Suffolk is and that he won’t be able to waltz toward a county title next month.